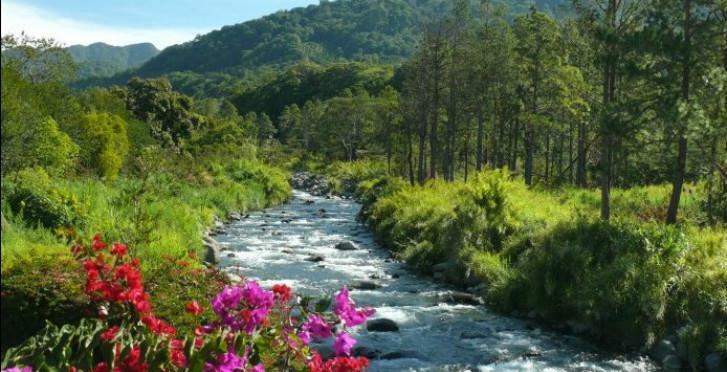 Valle Escondido, Boquete, Panama, Boquete, Chiriquí , For Sale by Boquete Land and Realty S.A.
Higher up in the valley here in Valle Escondido sits one of the prettiest villas that we have ever listed for sale. Asking just $549,000 this villa offers expansive rooms, huge window lines and beautiful views. The villa offers a compliment of outdoor living space with a working fireplace out back. The owner has planted coffee and a small herb and vegetable garden in the back yard which is very private and a special place to sit and relax. Indoors the living space is open and the glass lines of the home on either side of the living space brings in natural lighting. Even the dining area and kitchen areas have nice views, large windows and are spacious. The living room is bathed in light from the oversize windows and door that leads out to the beautifully landscaped large front lawn. The bedrooms are cozy and the bath and kitchen are also tastefully appointed. The office is an alternative 4th bedroom and is next to the full guest bathroom. The office also has a full attic with standing room, tiled floors and a window for lighting. The master bedroom is spacious as well and has a large walk through closet to the master bath. The master bedroom looks out into the privacy garden and is bright in the morning light. The master bathroom has a double sink vanity, a large bathtub and the large shower has an upgraded all glass shower door. Downstairs we have access to the garage door entrance and the gym room. The downstairs living space can be locked off and is a separate two bedroom, one bath apartment with its own kitchen, office nook and laundry which could be rented out to provide income. Come see this villa and you will agree that it represents one of Valle Escondido’s best values.